The assignment was to create a logo for a fictitious business. 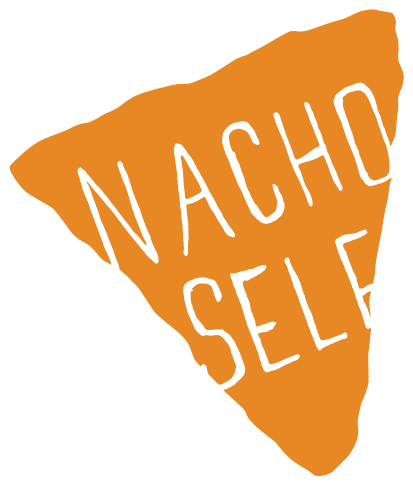 Nacho Self is a local chain of self serve nacho bars; which offer a clean hip place where each individual can create their own uniquely appetizing nacho creation. We are local company that supports local food sources whenever possible. You can feel good eating at Nacho Self because our options are always healthy and from responsible sources. ​With eight choices of protein, endless veggies and ten unique yummy salsas (oh and don't forget our famous guacamole) you will have no problem expressing a taste that in uniquely yours. A taste that’s not defined by us, but a taste that is defined by yourself. Oh did we mention we have lots and lots of cheese. Our locations can be found allover the Greater Northwest that we love and call home. Our customers take care of us, so we in kind take care of them. Nacho Self is dedicated to purchasing our product only form responsible farmers. We only offer organic meat and cheese, and pesticide free vegetables. Nacho Self is committed to a community that farms with integrity. You will have a blast eating at Nacho Self. Each one of your visits can be a unique with our many combinations of toppings. So come by grab some chips and begin the experience that is Nacho Self.